As always, we Disney Imagineers begin to create a new attraction, there are some many details included that it is almost impossible to see them all. One of the things that makes Disney parks so special is just that, the need to revisit elements of the parks over and over again just to make sure you see it all. We’ve tried to gather some details and fun facts aboutt the new ride for your to discover when you get the chance to go. Jewel Sorting – Follow Doc’s instructions, etched into a nearby plank, and help match jewels by colour and shape as they flow down a wooden trough—a.k.a. dozens of touch-screen video displays. The Vault – Inside the door of the mountain, enter the centre of the vault to find a collection of wooden barrels overflowing with glowing stones. Turn each barrel to see the ceiling above you transformed! The footprints of forest creatures and impressions of sticks, stones and acorns are embedded in the dirt path that lead to the attraction. The figures of Grumpy, Doc, Bashful, Sleepy, and Happy that can be seen in the cottage just before returning to the station originally appeared in Snow White’s Scary Adventure. Due to their movement, Snow White, Dopey and Sneezy were created for this attraction. The two vultures perched on the jib crane near the mine entrance are also original figures from Snow White’s Scary Adventure. Just passed the cottage their is also a figure of the Wicked Queen in her disguise peering into the cottage. She turns and cackles at the carriages as you pass. The animation of the shadows of the Dwarfs as they leave the mine were copied, farm by frame, from the original film. Jewels come in 6 different colours and 4 different sizes. The colours are red, green, amber, purple, blue and clear. 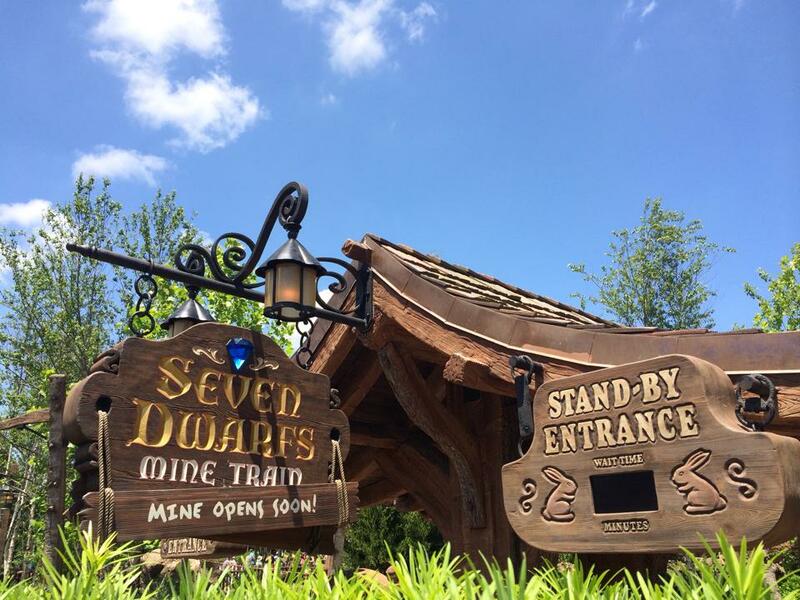 The mine cars are designed to reflect similar vehicles that appear in the film, handmade of wood by the Dwarfs, shaped with an axe, and used to haul rocks and jewels.